After approximately six months of remodeling Bienhoff Funeral Home has opened its new facility located at 100 Gaslight Road in Vandalia. In July 2018 Bienhoff Funeral Homes owners, Clyde and Cheryl Oligschlaeger, purchased the former Vandalia VFW Post 2173. The Oligschlaegers had been working to find a building in Vandalia due to the fact that they felt there was a need to have a physical presence there. The total interior remodel began immediately with future exterior improvements as the weather cooperates. An office, casket inventory room, updated restrooms, a large chapel area for services and visitations are just a few of the major improvements to the building. 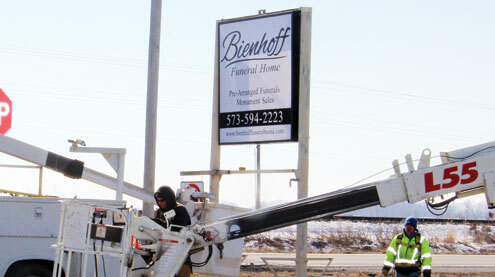 Bienhoff Funeral Homes also have locations in Perry and Laddonia which will remain open along with Vandalia. While they will not guarantee someone being at the Vandalia office 40 hours a week at least to start with, they are available 24 hours a day, seven days a week for appointments and services by calling 594-2223. The staff of Bienhoff Funeral Homes consists of four directors, Clyde and Cheryl, along with Austin Simmons of New London, Ed Briggs of Center, and Kathy Snyder who is in the process of taking her director test. Find more details about the company and the services they offer online at bienhofffuneralhome.com.